Nicolas Sarkozy ended his political silence by calling for Western intervention in Syria. Since his defeat in June by Francois Hollande, former French president Nicolas Sarkozy has been staying out of the limelight. Now he has surfaced to issue a joint communique with the head of the Syrian National Council, Abdelbasset Sieda, and a major leader of the opposition. The two spoke about the gravity of the Syrian situation and the need for rapid international intervention to prevent massacres while invoking the parallel of Libya. It should be recalled that Sarkozy took the initiative in the Libyan crisis and used the impending attack by the forces of Muammar Qaddafi on the Libyan city of Benghazi to get the UN Security Council to impose a no-fly corridor.This marked the turning point of the Libyan insurrection. The joint declaration served as an indictment of Sarkozy's successor, particularly as France now has the revolving presidency of the UN Security Council. Sarkozy's intervention was quickly echoed by his former lieutenants in the opposition UMP party. One of the candidates for leadership, party secretary Jean-François Copé, condemned the deafening silence of France. Why, asked Philippe Juvin a UMP member of the European Parliament, was France sitting idly by? Was it a case of fear? amateurism? a failure to grasp the moral implication? As far as August being summer vacation time, the UMP recalled that Sarkozy in 2008 had interrupted his summer vacation to launch a peace mission, ending the war between Russia and Georgia. Sarkozy's intervention was applauded by one of France's most important public intellectuals, Bernard-Henri Lévy, who called Sarkozy's initiative "courageous and welcome", particularly as it had broken Western silence on this issue "Aleppo today is like Benghazi yesterday." It was not sufficient to send doctors to Jordan "when the tanks are about to enter Aleppo, this is shameful." The ruling Socialists were quick to respond and reminded the UMP that their former defense minister and foreign minister, Alain Juppé, had stressed the difference between the situation in Libya and the Syrian situation. Socialist Party Secretary and Hollande's rival in the primaries, Martine Aubry, called Sarkozy's declarations irresponsible in accusing the French government of passivity; the country had to be united behind its leadership. She reminded Sarkozy that it was he who had received Syrian president Bashar Al-Assad in Paris with full honors. She accused the UMP of waging a mediocre campaign and exploiting the sufferings of the Syrian people for shallow political ends. 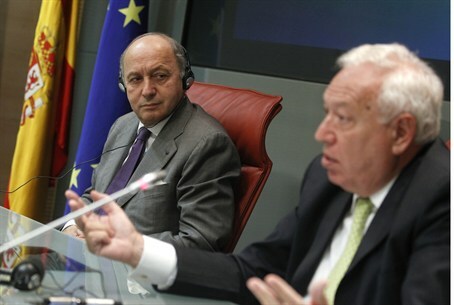 Foreign Minister Laurent Fabius reminded Sarkozy that Syria was bordered by Iraq and Lebanon (with consequences for Israel), by Turkey and Jordan; it was not isolated like Libya. Syria also possessed a large arsenal of chemical weapons. Like Martine Aubry, Fabius virtually accused Sarkozy of speaking out now in order to cover up his formerly cordial relations with Assad.